Dialectical Behavior Therapy (DBT) Information and Skills | Crank It! What can I expect from DBT? What components make up DBT? What are the DBT skills? 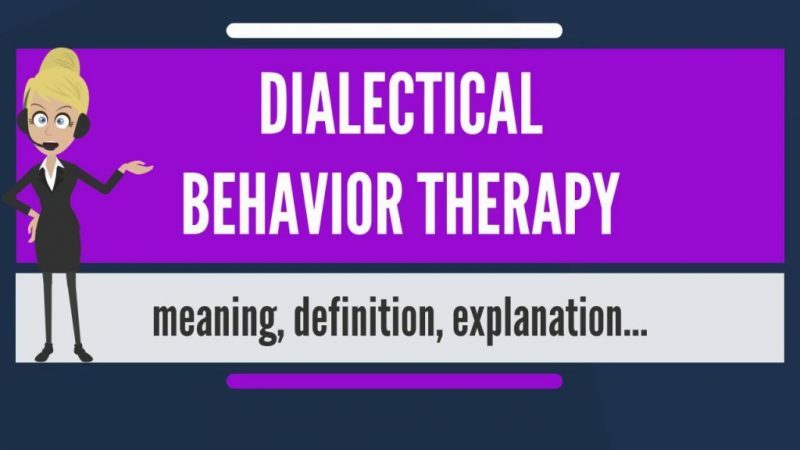 DBT stands for Dialectical Behavior Therapy, a type of therapy originally created for the treatment of Borderline Personality Disorder (BPD). DBT is still the main therapy for those with BPD, but also extends to help those with eating disorders, mood disorders, and many other disorders too. DBT teach people skills to give the person a tool kit of coping strategies. This helps to improve the reaction to crisis, regulation of emotions, relationships and other factors in their lives. Over the sessions, the person will slowly learn different skills, and how to use them in real life, so that they may experience less distress in their life. DBT is set up to involve both an individual and group component. DBT requires both a commitment to attending the therapy, so that the person may get the most out of it as possible, as well as the commitment to practice the skills learnt during the week. The group sessions are run with in small groups, usually about 3-20 people depending on the location and demand. The average group runs for 2 hours. In these sessions, you learn new skills through talking, handouts and practice. There is also time to speak about how you went during the week with practicing the DBT skills. The point of the group therapy is that you learn from each other, and find new ways to cope with the distress brought on by the illness you’re suffering. The individual session of DBT are run with either a psychologist, nurse or other healthcare member who has had relevant training in DBT. The sessions usually last around one hour, and give the patient a chance to discuss the issues that came up for them during the week. They are also given the chance to talk about the new skill, or skills, learnt in the group DBT sessions, and how they feel about implementing it. The therapist may give the patient time to practice the skill in the session, or discuss how and when they could use the skill, and what the barriers would be. There are four modules that make up a DBT skills group. These four modules aim to give the person a strong set of skills, of which they can rely on to reduce stress, suicidal feelings and crisis. Mindfulness is a concept that involves meditative exercises to bring a person to the present, rather than focusing on what has happened or what might happen. It helps a person to be in the moment, and pay attention to the current sense, feelings and emotions without passing judgement on those feelings. There are three main points in Core Mindfulness – the “What” skills, the “How” skills and Wise Mind. If other thoughts or feelings appear whilst observing, describing, or participating, you are taught to use a “Teflon mind”, and just let the thoughts slide past, and continue focusing on the present moment. The “How” skills involve thinking non-judgementally, one-mindfully and effectively. Non-Judgementally: Looking at things as facts, rather than seeing things as all the way to one side. For example, don’t label things as good, bad, fair, unfair, etc. Label things as they’re happening. For example: Think “I reacted overly aggressive when my mum asked me to wash the dishes” instead of “I acted so bad when I reacted that way when my mum asked me to wash the dishes”. One-Mindfully: Using the “What” skills from above to focus on only the current moment. Effectively: Focusing on what works and what is effective, rather than what we feel we “should” do. For example, you may feel like you should go help someone who is struggling, but what has worked in the past is avoiding triggers. In this case, you put yourself first, as this is effective and what works. Using these skills can help you to focus on the present, to be mindful of yourself and your feelings without letting yourself believe in extremes. Wise Mind is the focus of balancing the emotional mind and the rational mind. It works by thinking about the emotional and rational mind as two polar opposites. In a situation, we often react leaning to one side of those minds. What Wise Mind does is gets you to focus on the situation and balance it out so that you’re right in the middle of the emotional and rational mind. You didn’t get the job you applied for, and you’re now thinking that you’re absolutely horrible and telling yourself of course you didn’t get it. Using Wise Mind, you look and see that you’re focusing only on the emotional mind. Try to think of what the rational mind would say in this situation: there’s always another job, at least I tried, maybe the next one I apply for will be better. By utilizing the rational mind this way, you’re balancing out the two minds so that you’re sitting in the middle ground: Wise Mind. The skills of Distress Tolerance carry on from those learnt in Core Mindfulness, as it uses the skill of accepting and being non-judgemental. Distress Tolerance is based on learning to recognise negative situations, and their impact, and finding a way forward, rather than becoming too overwhelmed. Distress Tolerance is made up of multiple skills. This includes ACCEPTS, IMPROVE, Self-Soothe, Pros and Cons, Radical Acceptance, Turn The Mind and Willingness vs. Willfulness. These distractions can help to manage distress, by taking the mind off the distressing thoughts and focusing them on something different. Using these skills can help a person calm down from the distressing emotions that they’re feeling, and keep focused on the moment. Pros and Cons is a skill where you either physically or mentally list the negatives and positives in a situation, to help come to a conclusion about what you can do to positively influence, or accept, what has happened. In DBT, this goes in-depth to look at both the long-term and short-term pros and cons. Situation – Should I stop self-harming? Self-soothing is about using your senses in a way that brings comfort to you, and grounds you. The main aim is to engage all of your senses in a way that promotes self-care and comfort. Radical Acceptance can be a hard skill to understand and master. It’s about accepting situations that we can’t change for what they are. This includes minor situations, all the way to trauma. It’s about accepting the situation, so that you can make peace within yourself. You do not have to like something, or be happy with it to accept it, and sometimes accepting things is an ongoing process. The skill involves asking: can I change it? If I can, I will. If I can’t, I need to accept this. Radical Acceptance means that you accept that you can’t change it, so that you don’t keep fighting to find ways to try to adjust things. Turn The Mind fits in here with Radical Acceptance. This skill involves turning your mind from the focus on trying to change things onto the healthier alternative of trying to accept things. Willingness vs. Wilfulness is another one that fits in here – it’s about being willing to try to accept things for how they are. Emotional regulation is all about managing strong emotions that are hard to cope with, such as depression, anxiety or anger. It works by reducing vulnerability and building up positive thoughts and events. The skills learnt in the Emotional Regulation module include PLEASE, Mastery(Build), Opposite Action, Build Positive Experiences and Labeling Emotions. Using these skills helps you to reduce your vulnerability to negative emotions, by keeping yourself as healthy as possible. Opposite Action is a skill which is used when a person is feeling an unjustified emotion. The person learns to do the opposite of what the urges are saying, which can help remove that unneeded emotion and replace it with something opposite. Example: The urges are telling you to binge eat. Instead, you do the opposite of those thoughts, and go for a walk. As the skill name suggests, this skill is all about adding positive experiences to your life. Think about the things you enjoy, things you want to try, and things that make you happy. These don’t have to be big – even things just as reading a chapter of a book, or walking to the park can be things that people enjoy. Adding these experiences to your life a few days a week can really help to improve mood and reduce vulnerability to negative emotions. What was the event that prompted these emotions? How did I react to that event? What are the sensations that I feel in my body? What would my body language look like to a strange right now? What urges am I getting? What is a healthy action I can take? Knowing the answers to these questions can help to identify emotions. It can also help to compare your feelings to a list of emotions. Knowing which emotion you’re feeling means that you can take a healthy action to either help, or continue with the emotion, depending on whether it’s a negative or positive. The skills learnt in the module for interpersonal effectiveness help to build up assertiveness and interpersonal problem-solving skills, such as learning to express needs, learning to say no and learning how to deal with interpersonal conflict. These skills help to build up the chances of the person reaching their goal or aim, without damaging either the relationship or their own self-respect. The skills learnt in Interpersonal Effectiveness include DEAR MAN, GIVE and FAST. You can use the “MAN” part whilst doing the DEAR section. Being Mindful – Stay on track with what you want. Repeat that it’s what you need to get better. Appear Confident – Let them see that you really know you need this. Using these skills ensures that you’re respecting the person that you’re having a conversation with, and can therefore maintain that relationship. This skill is very important in maintaining self-respect and your own needs whilst talking to someone else. ← College Students and HPV: Should You be Concerned?